WAFFLES: Hey Boss. What's in the box? KATIE: Nothing's in the box. KATIE: Of course I'm sure. WAFFLES: Well what WAS in the box? KATIE: How am I supposed to know what was in the box? We're always getting stuff in boxes. WAFFLES: Uh... you don't think? KATIE: No, Waffles. I don't think there was a chicken in the box. WAFFLES: Really? Are you SURE? KATIE: Not EVERYTHING is about chicken. KATIE: Waffles, there's more to life than just chicken. KATIE: Of course there is. ...SALMON!!! Glogirly's opening the SALMON cupboard!!! WAFFLES: I still say there must have been chicken in here. Cat Lady Ceramics Giveaway Winner! Congratulations to Rene from It's All About the Cats and Cathy Keisha from Stunning Keisha! 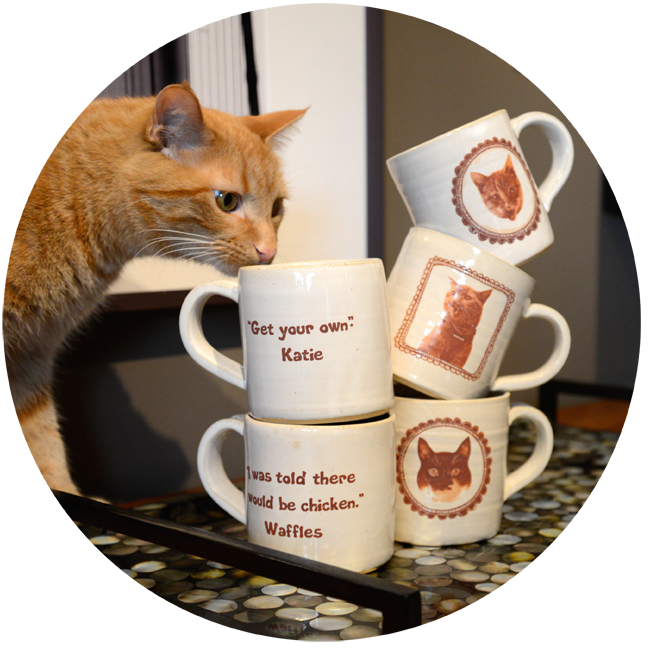 They're the lucky winners of a pair of purr-sonalized mugs from Crazy Cat Lady Ceramics! Thanks so much to everyone who entered! And stay tuned...there's more to come! You have a SALMON cupboard!?!?!?!?!? Let us know if you smell anything funky, Waffles! That looks like a very nice box. Just be careful Katie doesn't shut you up in it. What is a salmon cupboard and why don't we have one? These questions must be answered! Mom, can I have a salmon cabinet???? Waffles and Katie have one!!!! Hmmm Glogirly keeps interesting things in cabinets. Well, so far, all I've had here is cat food and a taste of sardines. So I'm clueless about all this chicken and salmon excitement. Chikken, salmon, I'll take both please! Cute as always. ConCats to da winners. Concatulations to the winners! Chickie .... salmon ..... It's all good! That looks like a great box. . . I wouldn't care what had been in it! But yeah...you have a salmon cupboard??! That's so cool! I'm sure if there was chicken in that box, you'll find it, Waffles! Ooohhhhh BOX!!! 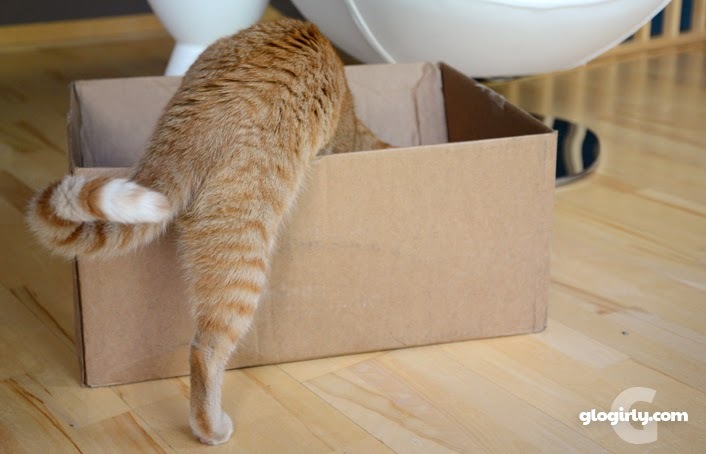 That's what we kittehs need, a service that delivers pawsome boxes on a regular basis. Waffles, did you trick Katie into thinking the Salmon cupboard was opening so you could have the box all to yourself? Chicken comes in boxes? Whaaaaaat? 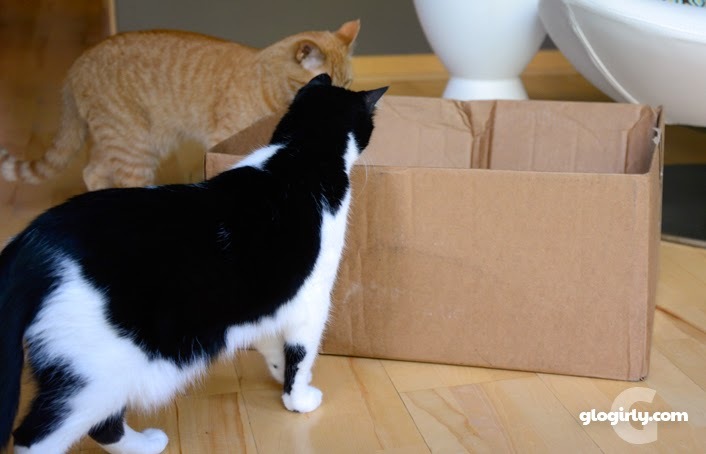 All this time, the only box we thought it came in was the big, humming box that is cold inside, and we can't get into that one. 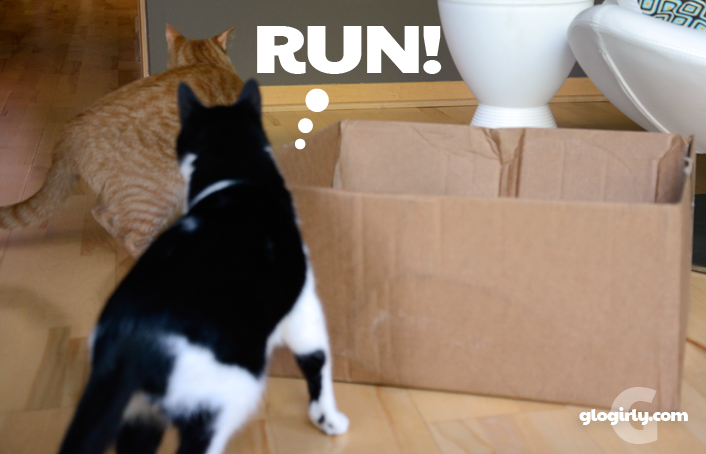 Waffles, maybe if you wish hard enough, maybe a chicken will magically appear in that box! I love Waffles never-ending quest for chicken..most kitties would be happy with just the box..Waff wants the box filled with chicken..mol..Concats to the winners! A Waffle or a chicken? Did you find the chicken Waffles? LOL. You're not crazy Waffles, I smell it too! well at least we know there was a Waffles in that box. Anything Fishy sounds good to me!! Hey Waff, do you like chick-hen that much? I do believe you’re abscessed [sic] by it. Wait, did someone say SALMON? Concats to CK! What was in that box Waffles?